The trucks where on strike this day of 1996 and blocking all the roads. 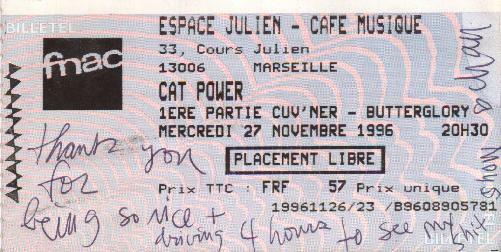 It took us four hours to go to the Café Julien in Marseille, although it should have taken two hours max. Sophie was with us but there were no place left for the show, so she had to stay outside (but she did not complain though: she met a guy this way)! So I was there for the show with Babak and Pascal. After Guv’ner and Butterglory, Chan Marshall started her show, with a guitar borrowed from a guy of the audience. The show was very nice and intense, but she was very nervous and could not finish properly any of the songs. After a while, she said she could not stand it anymore and left the stage. Nobody complained though, because it was a good moment. After the show, we tried to meet Chan but she was not showing. Hopefully, the girl from Guv’ner was passing by, and Babak gave her a magazine on which was a picture of Chan, asking her if she could ask Chan to sign it for us. After a few minutes, Chan joined us with the magazine, so we had the opportunity to talk with her and take a picture.